It’s been 10 years since I graduated from Duke University’s Fuqua School of Business, but it seems just like yesterday. And, I still remember the day I learned one of the most important lessons about competition from an unlikely source – Dave Thomas, the founder of the fast food chain Wendy’s. One of my professors relayed the now legendary story. Thomas was invited to speak at Fuqua and talk about his family business. During his speech, he asked the audience of MBA students, “Who is my biggest competition?” Of course, the students quickly answered with Burger King or McDonald’s. He shook his head and smiled. He said, “No, my biggest competition is people eating at home.” When my professor shared this response, you could have heard a pin drop. We MBAers just got schooled on the true nature of competition. To help share these lessons, we want to walk you through how you can identify your competition and truly understand your greatest threats and opportunities. Though it may seem unlikely, a glimpse at your family tree can be helpful in thinking about competition in the social sector. 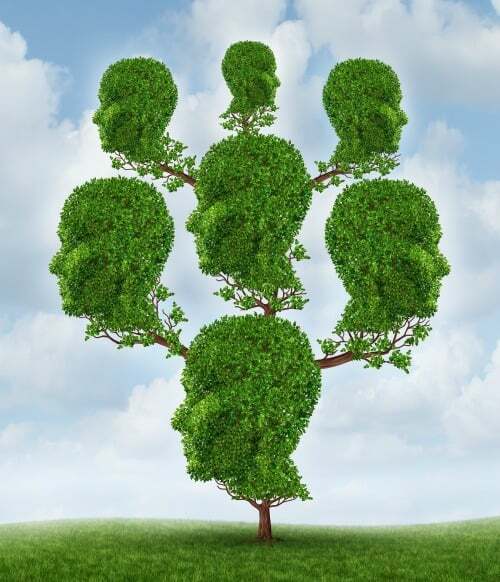 Your family tree is a representation of your immediate, extended and distant relatives, which is much like how we can think about our competition. Generally speaking, we tend to share more similarities and traits with immediate family members. We see them with more frequency and are more intimately familiar with their lives. The further removed you go in your family tree, the less obvious your ties. Competition works the same way – our direct, indirect and distant competitors share varying degrees of mission and market similarities. Why Is Tracing Our Competitive Roots Important? Understanding your competitive roots can shape your organization’s strategy and ensure you are performing at your best. Knowing your competition is particularly important for launching a new service or social enterprise, building collaborative strategies or attracting investors. Understanding your competitors’ strategies can help you differentiate your own strategy by understanding your unique value proposition. Additionally, too many competitors in a field may be a sign that the market is saturated, adversarial or highly competitive. These are all factors that may dissuade an organization from starting a new venture. Considering all possible competitors in the space can help your organization build a winning strategy for your grant or business plan that mitigates organizational risks. How Can We Find Our Competitors? Like immediate family members who share similar traits and characteristics, an organization’s direct competitors often have much in common. Direct competitors are the most obvious – they are in the same business, your staff likely sees their representatives at coalition meetings and your organizations compete for the same customers and funding. Example: An afterschool program’s direct competitors are the other afterschool programs (public and private) operating in a reasonable geographic vicinity of the center. To find your indirect competitors, take a step back in your family tree. 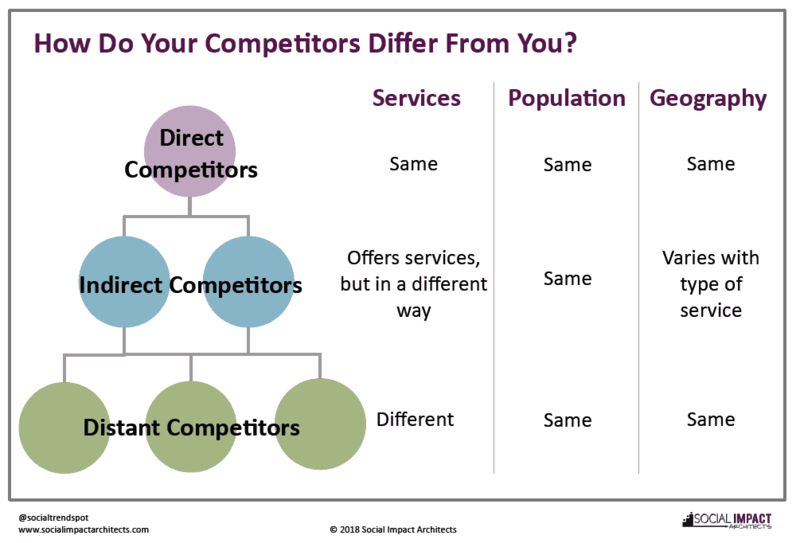 Like extended family members who share the same roots, indirect competitors will offer services to address the same need or problem, but in a different way or geography. They may not share a similar mission, but are near perfect substitutes to your service. Indirect competition also includes organizations that would be direct competitors if they operated in a closer geographic boundary. Example: An afterschool program’s indirect competitors include other activities designed to occupy children’s time and build skills like sports, extracurricular school programs (e.g., mock trial, student council) and volunteer opportunities. It also includes other afterschool programs in the state that may compete for the same funding, but not the same customers. Like a third cousin once removed with whom you think you have nothing in common except a remote ancestor, distant competitors are not always obvious. Distant competitors include alternatives to your product or service in the broadest sense. They do not share the same primary mission and are marketed differently, but they compete for the same population’s time and resources. Distant competition also includes free alternatives or apathy. Example: An afterschool program’s distant competitors include other alternatives that compete for kids’ time like part-time employment and entertainment venues like the movies, shopping malls or parks. It also includes parents sending their children home unsupervised or to be taken care of by other friends and relatives due to cost constraints. It could also possibly be an attitude that there is little value in afterschool programs. As you define your strategic or business plans this summer, we hope you take a moment to consider all your competitors in the field and how they may impact your approach. And, remember sometimes the greatest competition we have in the social sector isn’t the organization down the street, but people doing nothing and not seeking our help. Conducting a thorough competitive analysis can make all the difference, and we invite you to share how it may have helped your organization succeed. Great post this week. So often non-profits view their services (ie business models) as so unique that they defy comparison. With the number of non-profits in the US, that is a false assumption. Non-profits should view themselves as businesses where analysis of the competition is critical to long-term success. I hope we all use this week’s exercise to assess where we are in the competitive landscape!